Before Adam and Eve did mankind sin? From the studies I see, Adam and Eve were the 1st sinners in this 2nd age. Unless I missed something. That means if a sin is not sincerely repented of, it can cost you anything from failure to receive God’s blessings in your life, to failure to qualify to enter into His eternal family household. With all of that said, it’s not written, Biblically, whether or not Adam and Eve were the very first sinners in this flesh earth age. However, it’s assumed by the Christian church that Adam and Eve were the first sinners, because in general, church tradition teaches that Adam and Eve were the first human beings on earth. But of course, that assumption by the church is just not true. The races of the sixth day creation were created during the “sixth day” (Genesis 1:26-31), which, of course, is the six thousandth year of this flesh earth age (II Peter 3:8). But we know from Genesis chapter two that Adam wasn’t formed until the eighth day, or better stated, the eight thousandth year (2 Peter 3:8) of creation, after God had rested from His initial labors on the seventh day. So there’s some 2,000 years of time between God’s sixth day creation of the various races, and the time of His eighth day formation of Adam (Genesis 2:7). So when you consider the fact that the 6th day creation (i.e., the various non-Adamic races) were here on this earth for 2,000 years before Adam was formed by God in Genesis 2:7, then it becomes pretty clear there must have been plenty of sin on this earth long before the time of Adam and Eve. However, it’s also important to note that the written law — meaning the Law of Moses — had not yet been given during the time of the sixth day creation, nor during the time of Adam and Eve, and, in fact, wouldn’t be given for several millennia after Adam, until the time the 12 tribes of Israel moved into the Promised Land. The Law of Moses actually classified sin and spelled out the punishments for various sins. In other words, sin was certainly in the world from the very beginning, all of the way back to the sixth day creation of the various races. But because there was no written law delineating what kind of action constituted sin, and what the punishment for the various sins would be, those sins were not imputed to the people who committed them. The sins weren’t counted against them in terms of the final judgment. However, it’s very likely man had his own code of law, and that civil punishment for violation of those laws was the norm. Man was much more civilized back then than we’ve been led to believe. In just a moment, we’ll take another look at that same verse above, and include the verses around it, as well, to get an even better understanding of this topic. Even the angels in heaven sinned during the first age. And to this very day angels in heaven still sin, thanks to Satan’s influence (Revelation 12:7-9). So to think that the much weaker flesh man didn’t commit sin for some 2,000 years until Adam messed up in the Garden of Eden takes a real stretch of the imagination, in my opinion. If there was no written law during the time of the sixth day creation, as well as during the time of Adam and Eve, what law could the members of the sixth day creation have possibly broken in order for there to be sin in the world before the time of Adam and Eve? The answer is this: It was the same type of law that Adam and Eve broke, which is to say, God’s oral law. In my own view, long before Adam and Eve came along there was very likely oral law in existence, from God. 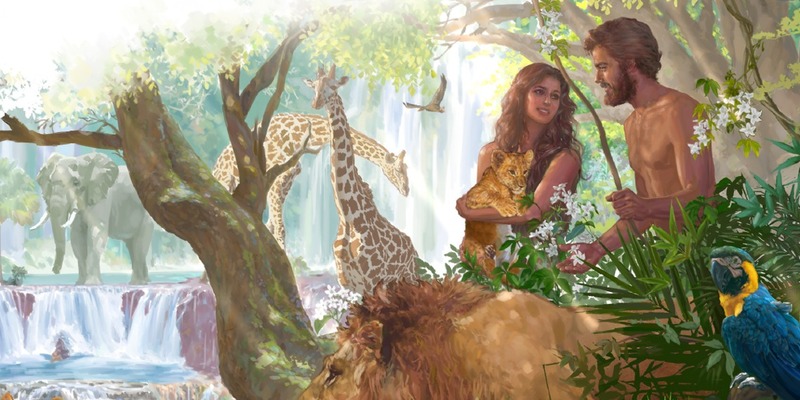 In other words, just as Adam and Eve, in the Garden of Eden, had received oral law directly from God telling them not to eat of the fruit of the tree of the knowledge of good and evil, in like manner the sixth day creation had probably received oral law directly from God, as well, right from the start of their existence. After all, they were God’s children. And God doesn’t just create children and throw them into this wild world without giving them some kind of guidance and direction… some kind of knowledge of right and wrong. That was God’s oral law (or oral commandment) to Adam. You’d think that simple oral command would have been very easy to obey, especially with a death penalty attached to it. But apparently it wasn’t. Likewise, it’s very likely, in my opinion, that God had already long-since given oral law to the members of the sixth day creation, as well. And it’s just as likely, in my opinion, that the sixth day creation sooner or later disobeyed whatever oral law God gave them, just as Adam and Eve would, later. The various races of the sixth day creation probably disobeyed that oral law routinely, just as mankind routinely disobeys God’s law today. But sins that were not spelled out to the people simply weren’t imputed to them (i.e., counted against them at the final judgment) until the written Law of Moses, which spelled sins out in great detail and explained the punishments. After all, no matter what race we’re from, we humans just have a way of following our lower animalistic flesh nature rather than our higher inner spiritual nature. So yes, there’s not a man on this earth, except for Christ, who has not sinned. And that certainly would include the members of the sixth day creation. They sinned, long before Adam and Eve sinned — even before Adam and Eve existed. The difference between Adam’s failure, and any sins that might have been committed by members of the sixth day creation, was that Adam, exclusively, was supposed to typify Christ. In other words, I believe Adam was ultimately supposed to become God’s personal representative, or “shepherd,” on this earth to the sixth day creation, to help lead them away from their own sins and back to God. He was supposed to typify, or represent, the coming Christ, the Good Shepherd. But when Adam was tested in the Garden, at the temptation of Eve, he failed that test and lost his opportunity for that lofty leadership position. Adam couldn’t even lead his own wife away from temptation and sin. Nor could he resist participating in the sin, himself, the very first time he was tested. So how could he possibly be used by God to lead the sixth day creation away from their sins, whatever they might have been? I believe it’s very likely that, had Adam resisted the temptation to sin against God in the Garden, and had he led his wife away from that sin, as well, he would have been used by God to teach and guide and even lead (i.e., shepherd) the members of the sixth day creation away from their sinful nature and back to God. In other words, way back then, I believe Adam would have been used by God as the “good shepherd” to the various races of the sixth day creation. But Adam failed spectacularly. So rather than being chosen to lead (i.e., to shepherd) the members of the sixth day creation back to God, he and his wife Eve were simply cast out by God among the members of the sixth day creation, as fellow sinners. Adamic man was supposed to be of a higher order, spiritually speaking. You might call it a higher moral order. But both Adam and Eve missed the mark. They failed the test. They proved to be no better than the sixth day creation, spiritually speaking. Worse than that, the sin Adam and Eve committed in the garden was the very first sin that carried a death penalty. And of course, that “one man” was Adam. And that’s where the churches gets the tradition that Adam was the first sinner. However, that word “and” that I’ve bold-faced in the verse above is translated from the Greek word kai (i.e., Strong’s G-2532), which is both copulative and cumulative in nature. In other words, you have to take the two thoughts expressed in that verse together. Both sin and death entered into the world through Adam. Not just sin. But sin and death. In other words, I believe Adam’s sin wasn’t the very first sin ever committed, but instead, was the very first sin that had a death penalty attached to it. Keep in mind that the oral commandment broken by Adam was this one: “But of the tree of the knowledge of good and evil, thou shalt not eat of it: for in the day that thou eatest thereof thou shalt surely die” (i.e., Genesis 2:17). So I speculate that while there was indeed oral law, from God, for the sixth day creation to follow, the oral commandment given by God to Adam some 2,000 years later was the very first oral commandment that carried the death penalty if one failed to obey it. So I still don’t believe Adam was the first sinner. He was just the first one who committed a sin unto death, and even then, only because God had attached the death penalty to that particular sin when He first verbally warned Adam against it in Genesis 2:17. What’s more, that specific sin committed in the garden would bring Satan’s murderous child, Cain, into this world, which is how the first death happened, i.e., Cain killed Abel. What’s more, I believe Adam and Eve were the only ones who could break that specific oral command from God, because it had been given exclusively to them. The sixth day creation didn’t have access to the Garden of Eden, and thus could not have eaten from the tree of the knowledge of good and evil which was “in the midst” of the garden. So, just as the elect of God, in this end generation, are likely the only ones who can lose their salvation by refusing to be used of the Holy Spirit when it comes time to testify against Satan and his earthly henchmen at those great trials described in Mark chapter 13 (see Mark 3:28-29), so Adam and Eve in that very first Adamic generation were the only ones who could break the first law that had a death penalty attached to it. So sin was definitely in the world, from the very beginning (i.e., “for until the law sin was in the world.”). Man sins. That’s no surprise. But sin that was not “after the similitude of Adam’s transgression” was not imputed to people before the written law was given to Moses and then passed on to the people of Israel. And death from sin was not in the picture until the time of Adam (i.e., “death reigned from Adam to Moses”). Why? Again, in my opinion, it’s because Adam’s sin was the first one with a death penalty attached to it. Adam’s sin ushered death into the world. Previous to that, there had apparently been no death at all, in spite of the fact that there had been sin. In other words, Adam was a type of Christ. But he utterly failed the temptation test when it was presented by Satan in the garden. So he was not qualified to lead the races of the sixth day creation away from sin and back to God, which would have been his job had he not sinned. On the other hand, however, consider the fact that when Jesus’ ministry was about to start, He also was tempted by the devil in the wilderness, just as Adam and Eve were tempted by the devil in the Garden of Eden. Indeed, after His baptism, Jesus was immediately led into the wilderness by the Holy Spirit to be tempted by the devil for a full 40 days (Luke 4:1-2). And while He was there, He ate nothing, which weakened Him, physically. What’s more, at the very end of those forty days, when He was at His absolute physical weakest, the devil really poured it on (Luke 4:2-3), tempting Him three more times. Yet even as weak as Christ’s flesh body and flesh mind must have been after such a long fast from food, He nevertheless successfully resisted the flesh temptation to sin against God, making Him God’s example and representative to the people of this earth. So unlike Adam, who failed the leadership test at the very peak of his flesh power, Christ passed the test of temptation with flying colors while at His very weakest flesh point. By successfully resisting the temptation to sin, Christ did what Adam had so spectacularly failed to do in the Garden of Eden. Therefore, Christ was chosen to teach and guide all of God’s children, and show them the way back to God. Indeed, He had been sent into this flesh earth age for that very purpose, because Adam’s failure had left mankind in a morass of sin, and in an otherwise unstoppable downward spiral, spiritually speaking. In other words, Adam failed when it came time for him to be God’s “shepherd” to the sixth day creation. But Christ didn’t fail. He became our Good Shepherd, and was chosen by God to lead us, as lost sheep, back to God through His perfect example. And we, as Christians, are now supposed to emulate that example to the very best of our abilities. So I believe Adam would have been that “good shepherd” to the sixth day creation, had he not failed the test when Satan tempted Eve in the Garden. Again, Adam not only couldn’t lead his own wife away from the sin, but joined Eve in partaking of the fruit of the tree of the knowledge of good and evil (Genesis 3:6) — a double failure if you think about it. Christ, however, did not fail His test in the wilderness when Satan was allowed to tempt Him for the entirety of those 40 days of flesh weakness. Therefore, while Adam is referred to in the Scripture as “the first man Adam,” Christ is referred to in that same verse as “the last man Adam” (I Corinthians 15:45). Christ is the “last man Adam” because there will never be a need for another shepherd over God’s People, to lead them back to God. Our Lord and Savior fulfilled all of the qualifications. He passed the test. He never faltered. He never gave in to temptation or sin. Not once. And during the course of His ministry, He never failed to work to lead God’s children away from sin, and back to God. Adam failed, and I believe that in failing in the Garden of Eden he lost the leadership role he would have had to the sixth day creation. But Christ Jesus perfectly fulfilled every aspect of the role of the Good Shepherd over God’s creation. Therefore it’s through Christ that we have the ability to return to God, have our sins forgiven, and live forever in God’s eternal family household. That’s why the Scripture above says that while Adam was “made a living soul,” Christ was made “a quickening spirit,” meaning a life-giving spirit from God. He’s our Shepherd leading us back to God and to eternal life. The bottom line is that there was indeed sin in the world before Adam and Eve. But that sin was not imputed to the various races of the sixth day creation, because there was no Law of Moses at that time which delineated both sin and the punishment for it. During the sixth day creation, man most likely had civil law, and civil punishment for breaking it. But God’s law did not exist at all, in terms of the Law of Moses, which would not come about for several more thousands of years. And finally, Adam’s sin, which was a breach of God’s first verbal command that had a death penalty attached to it, was what brought “death by sin” (Romans 5:12) into the world.